Okay, this is the first time that I've ever featured POTUS on my website. 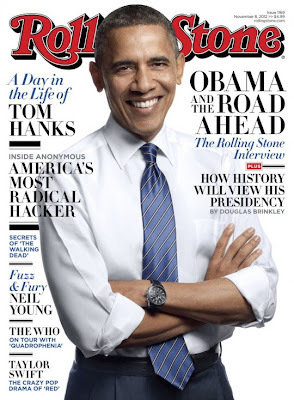 Barack Obama took time out of his campaign and presidential debates to sit down with the folks over at Rolling Stone magazine. Looking laid back on the cover, Obama obviously speaks on Politics in the magazine interview, Obama also called his opponent Mitt Romney the "other guy" and a "bullshitter", Barack went there!! No Doubt just released a brand new album 'Push and Shove' after 11 years, and their lead singer Gwen Stefani sat down with Nylon Magazine America. The 43 year old mother of one, spoke on fame, reunion, her inspiration, and how music has changed. A very interesting article (read the rest of it below). Got a secret, can you keep it? Swear this one you'll save, better lock it in your pocket. Taking this one to the grave, If I show you then I know you, won't tell what I said. Cause two can keep a secret if one of them is dead! If you religiously watch Pretty Little Liars like myself, then you'll definitely be familiar with the lyrics to the song above! Shay Mitchell who plays Emily - a lesbian on the hit TV show Pretty Little Liars on ABC, Flaunts all she's got in Flaunt Magazine, giving us a sultry look. The actress speaks on her acting goals, and even how the public reacts to her on the show. She looks HOT! in these pics, and I cannot wait to see the rest of the mystery unveiled in Pretty Little Liars in January! Ooh, the anticipation. 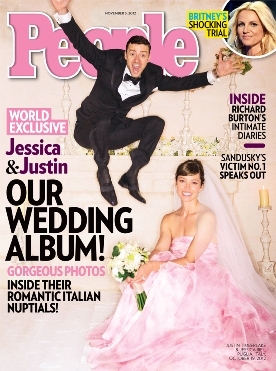 Click the link below to see pics of the newly wed - Justin Timberlake and Jessica Biel. And the "controversial" Lucky Magazine - Britney Spears issue!! Aww, congratulations to Justin Timberlake & Jessica Biel who recently got married. This is one hot white couple, and I wish them all the best. They're wedding pics feature in People Magazine which is out on Newsstands today. Firstly, what is that on Britney's head? Is that a wig, lace-closure or a lace front? Either way, whatever it is, it's got to go! Britney Spears fans were not happy when they saw the cover of this magazine, saying that Britney looks "unrecognizable" on the cover of Lucky Magazine. I don't think she looks that bad, her hair is not the lick though, let's get that cleared up. Other than that, check out the rest of the pics from the photoshoot, Lucky Magazine took it to their twitter page to apologise to Britney fans over the cover.